Just proves there is always a way to carry some­thing if you think it through. This is what I’d call a proper “Big Headed Idea”! After last week’s blog about Felizando being dis­missed from 6th grade because his fam­ily was too poor to afford a uni­form, I received a let­ter from one of our part­ners in Aus­tralia. Frances wanted to help, and got her 3 Uni­ver­sity aged chil­dren involved also. 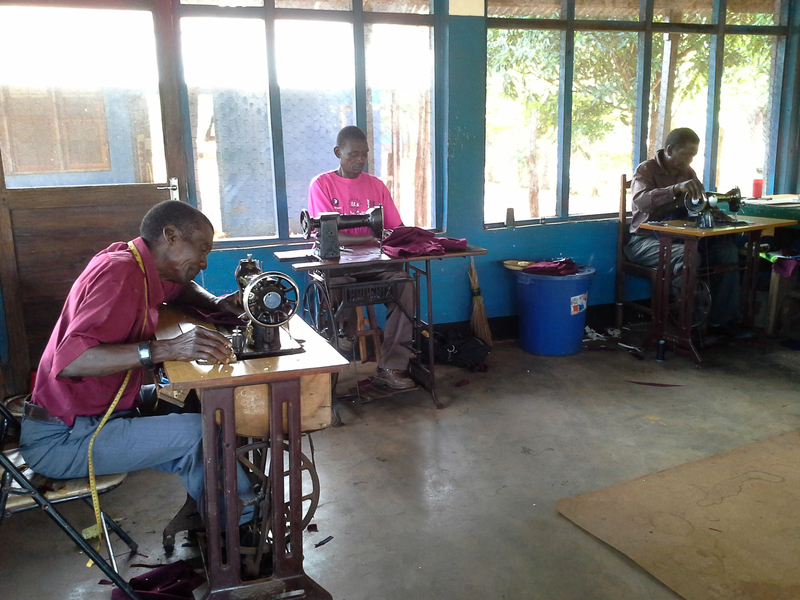 Together, they orga­nized enough funds to buy the mate­ri­als and pay 3 men to sew 150 uni­forms for the chil­dren that were expelled from the school. Capena, my office Admin­is­tra­tor, spoke to the School Prin­ci­ple on Mon­day, who was ECSTATIC that we could help. It is LAW in Moz. that the chil­dren in the main Dis­trict school wear proper uni­forms. The first 14 chil­dren were mea­sured the next day and uni­form mak­ing began. But we were unable to find enough of the maroon mate­r­ial in the Balama mar­ket to meet the need. The man­ager of the local graphite mine came by that evening to bring us a suit­case of cloth­ing he wished to donate from closet in Aus­tralia. I told him of the prob­lem, and he said “give me a swatch of what you need”. His truck was going to Pemba the next day and he DONATED 150 meters of the mate­ri­als which he deliv­ered to us last night. When God moves, HE MOVES, and let no man get in His way! So our Uni­form Fab­ri­ca­tion Shop is work­ing at full capac­ity, as now we have all we need to do the job. It will take sev­eral weeks of “Pedal Power” to get all 150 done, but the school has agreed to let the chil­dren stay while the uni­forms are being made. I love it when God puts a plan into motion! 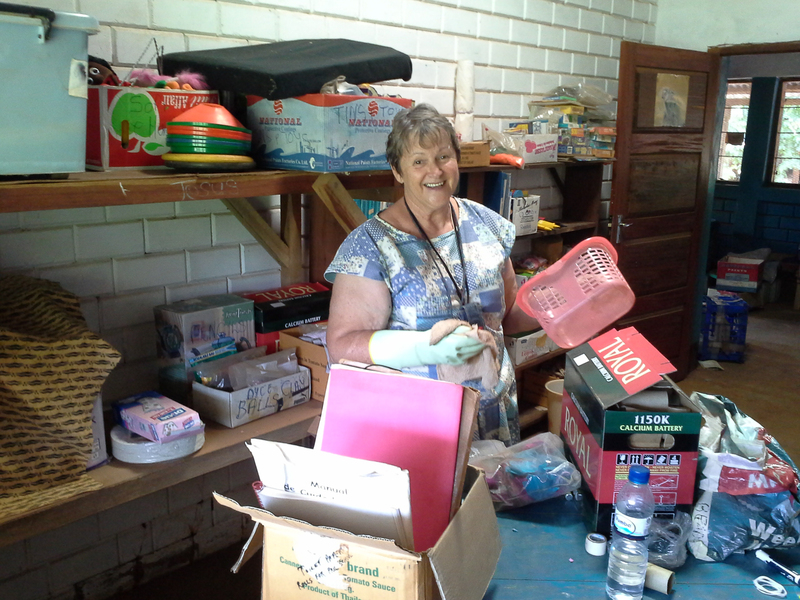 THANK YOU to our Aus­tralian friends who saw a need and stepped for­ward in faith to make it happen. P.S. 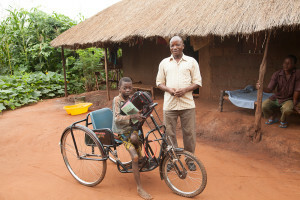 Felizando is now sleep­ing at the home of Youth Leader, Daude, dur­ing the week so he doesn’t have to walk 12 miles (20km) each day to get to school. His father came in Wed. to check on him. He told his Dad that he’d never eaten so well, and was super happy! This young man has never tasted 3 meals a day. Sad, but true, for many chil­dren all across Africa. What we take for granted, is not the norm for many. Hear­ing the whop, whop, whop of heli­copters over­head is not a nor­mal sound for Balama. But it sure lets every­one know that he has arrived. For the next 2 days there will be speeches and many activ­i­ties as over 50,000 locals could flow into the area to hear what he has to say. When some­thing like this hap­pens, the whole town does a major clean up, includ­ing us. Our part was to use our trac­tor to fill in some mud holes in the speak­ing area park­ing lot, and fetch the African dance teams from 2 of the vil­lages. The roads all around get graded for a less bumpy ride for these gov­ern­ment offi­cials, and for that we are truly grate­ful. Bounc­ing Bunny is not just a joke around here, it’s reality! Until next week! Keep your eyes on the Lord and your heart free of sin, for His return is very near. First Blood Moon is April 15th. On March 1st, I told you about Salazar, a mem­ber of our Rovuma church, and how the Lord told me to get him new shoes. Salazar walks 5km (3 miles) from his vil­lage, Nacala, to the Rovuma church each Sun­day. Nacala is DEEP in the bush with only a foot path con­nect­ing it to the Rovuma vil­lage. Well, the story con­tin­ues, as I found out this week that Salazar had to loan his new shoes to his son, Felizando, so he could go to school in Balama. In the vil­lage schools (1–5 grades only), no shoes are required. I found out yes­ter­day that the shoes were way too big for his son, so he only wore them into the class­room for “show”. Twelve year old Felizando, is the FIRST AND ONLY STUDENT FROM HIS VILLAGE to enrol in the 6th grade in the Balama school, which is 10 km (6 miles) from his home. After 6 weeks of walk­ing the 12 miles to and from school each day, this young man, who is recov­er­ing from mal­nu­tri­tion, is exhausted. We’ve been sup­port­ing his fam­ily with food for the last 30 days, as they are all sick due to mal­nu­tri­tion. Thus, these daily long walks have been too much for Felizando at this time. On Fri­day, Felizando was DISMISSED from school along with 150 other stu­dents who couldn’t afford uni­forms. Super upset, he left for home, know­ing that this ended his edu­ca­tion since his Father could never afford $20 for a uni­form. Lit­tle did Felizando know that his “FATHER IN HEAVEN” knew otherwise. Salazar came to me Fri­day after­noon to beg help, ask­ing if we had a uni­form his son could use. We had none, so, Bunny Brain goes into high gear and makes a plan. Our seam­stress had left for the week­end, so I sent our guard via bicy­cle to his home to tell him that I needed his help on Sat­ur­day to make this young man’s uni­form. He agreed, and is mak­ing it as I write this story to you. 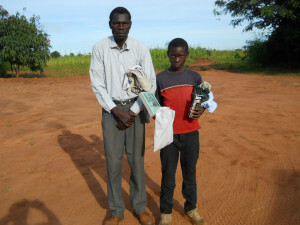 I then found a pair of ten­nis shoes left by a vis­i­tor that just fit this young man. Searched the school box and found left over school sup­plies from our stu­dents, so I out­fit­ted him with a math set, back pack, note­books, and pen and pen­cil, since he only had a note­book and pen. I asked Salazar if he’d allow his son to sleep at one of our Pastor’s homes dur­ing the week, so he’d only had to walk to his vil­lage on week­ends. Both he and Felizando read­ily agreed this was a won­der­ful solu­tion as they have no fam­ily in the area who could help out. Where he will sleep is still being orga­nized, but I will find a place for him nearby where he will be well supervised. I knew when I met Salazar, that there was some­thing “spe­cial” about him. He loves the Lord, is edu­cated, and eager to do what­ever it takes to pro­tect his fam­ily. He will now be our “evan­ge­list” in Nacala, and receive spe­cial train­ing to work as Pas­tor Joaquim’s assis­tant in the church. I sense in my spirit that God has BIG PLANS for his man. It will be won­der­ful to watch his story unfold as he takes the Gospel to the deeper parts of the bush where JESUS has never been preached. Pas­tor Ramadan of Namara Vil­lage came to tell me yes­ter­day that JONAL, (story in March 8th blog) has been spread­ing the word about how JESUS saved his baby and wife with the mir­a­cle birth. Since the hos­pi­tal visit, all 4 fam­ily mem­bers are now healthy and many are lis­ten­ing to their story. Pas­tor Ramadan has been swamped with requests to come talk to fam­ily groups about Jesus! Looks to me like REVIVAL may be break­ing out in Namara! ELZABE THE “BUSY BEE” STOREROOM KEEPER! Elz­abe spends 8–9 hours a day work­ing in our 3 major store­rooms, get­ting things sorted and reor­ga­nized for more effi­cient use. I’m very, very, very happy to have her on board, as this is a job that was beyond what I could han­dle with all the day to day respon­si­bil­i­ties here. We are also thrilled that Elz­abe would like to come back and help run the mis­sion sta­tion dur­ing food buy­ing (May/June). Since it looks like there will be no vis­i­tors to help us at the barns this year, that makes for a heavy load for Bunny and her staff. Elzabe’s help to keep us fed, and the mis­sion run­ning smoothly, will be most welcome! 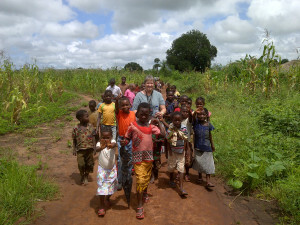 Bless­ings to all of you and THANKS for help­ing us to spread God’s love to the chil­dren in Mozambique. ZITO GIFTED WITH A BIG WHEELS TRICYCLE! Social Ser­vices donated a new tri­cy­cle to Zito to allow him to be inde­pen­dent in get­ting to school. The wheel­chair we orga­nized worked well for short dis­tances, but the school is 300 yards away. The rough dirt path was impos­si­ble for him to nego­ti­ate alone, and at this time of the year it is pure mud. Zito proudly shows off his BIG WHEELS TRIKE to Papa Eric who snapped the photo, before head­ing off to his 2nd Grade Class­room. JONAL, a Mus­lim liv­ing in Namara vil­lage, totally doubted all the sto­ries he’d heard his friends tell of pray­ing to Jesus and receiv­ing mir­a­cle heal­ings. Then his wife, Amacina (Ah-mah-seen-ah) went into labor. On her 2nd day of labor and still no progress, Jonal called for the Balama ambu­lance, but it was in another part of the Dis­trict. He told me that he tried every prayer he knew to Allah, and even begged the Catholic priest to pray to the Saints for his baby to be born soon. Noth­ing hap­pened and the sun came up on day 3 of her labor. 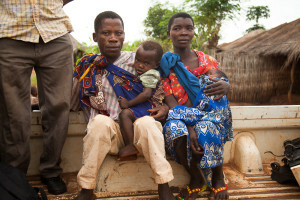 Then Jonal remem­bered about Jesus, and cried out for Him to help his wife and baby. Within 15 min­utes baby LOUIS was born, and the man knew Jesus was real! Since this fam­ily lives a bit to the north of Namara, no one from the Namara church knew of this great mir­a­cle until the fam­ily showed up in church last Sun­day morning! After telling his story, Jonal and Amacina both con­fessed Jesus Christ as their Lord and Savior. On Thurs­day night March 6th, Pas­tor Ramadan in Namara called to ask if we could send a truck to fetch Amacina for a med­ical con­sult. 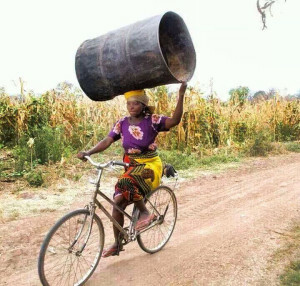 She was not well and couldn’t sit on a bicy­cle for the 14 km (8.4 mile) ride to the Balama hos­pi­tal. (After 3 days in labor, I’d guess not!) Good thing they brought the whole fam­ily, as the Doc­tor needed to treat all 4 of them for dif­fer­ent ill­nesses includ­ing severe ane­mia. They have a 1 year old lit­tle boy as well as baby Louis. Our truck took them back at noon, loaded with gifts from us which included vit­a­mins, baby clothes, as well as a 132 lbs (60kg) sack of corn (mealies) and 66 lbs. (30kg) of beans to keep them well fed. Our dri­ver, Manel, is a Pas­tor as is Ramadan. Both did some seri­ous spir­i­tual coun­selling and pray­ing with this cou­ple after they arrived back in Namara. After Louise was born, they had taken him to the witch doc­tor, not know­ing any bet­ter. 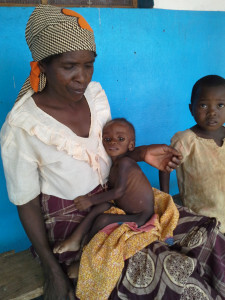 Pas­tor Ramadan will con­tinue daily coun­selling to help this fam­ily “learn how to walk with Jesus”. This lit­tle one has suf­fered tremendously .….…. Eric’s long-time friend, Elz­abe Barn­hart, from South Africa is a retired Exec­u­tive Assis­tant from a large cor­po­ra­tion in South Africa. She is truly gifted in orga­niz­ing and offer­ing fresh ideas on how to bet­ter orga­nize store­rooms. In her first 2 days she iden­ti­fied sev­eral ways to help ease my work load. Elz­abe and I are both “doers” and very “effi­ciency minded”, so we hit it off right away. She is a super bless­ing, bring­ing the much needed help that I have prayed for. The rains con­tinue, and our roads are mushy, but we con­tinue to take the gospel to the vil­lages via bicy­cles, motor­bikes, and our trucks. THANK YOU for your Love Gifts that make our work possible. 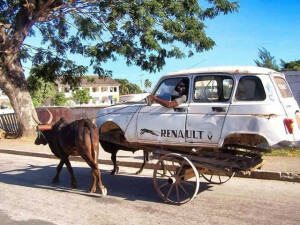 Most cars have “horse power”, and then there is the dou­ble OXEN POWER! 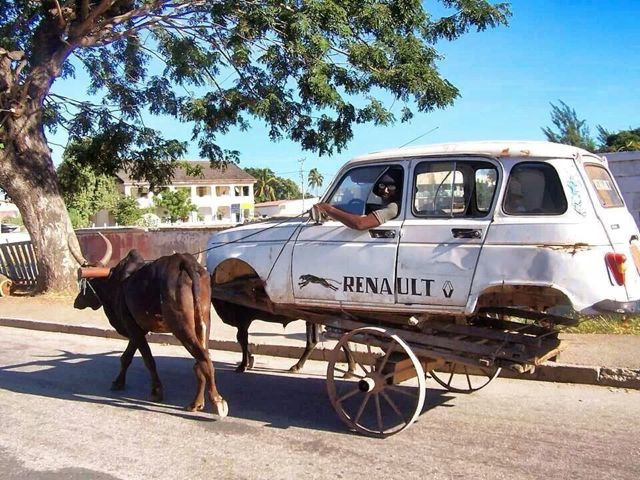 (A/C costs extra!) Keeps the dri­ver dry in the rain and out of the sun in the dry season. Eva, our 14 year old with mild men­tal chal­lenges, came down with severe malaria (vom­it­ing and inabil­ity to walk) late last Sun­day after­noon. So off to the hos­pi­tal we went (Dominica our Woman’s Pas­tor gave me a hand with trans­lat­ing) to get her admit­ted and on an IV drip as she was severely dehy­drated. It is our pol­icy that when one of our chil­dren is in the hos­pi­tal, we ask another church woman to help out with their care. Chil­dren can­not be left alone even one moment for fear they will tear out their IV, or try to leave their bed to go sit out­side. Our cul­ture is totally out­doors so being inside seems like a prison to these chil­dren. Our church mem­bers visit our sick chil­dren through­out the day, but each evening I take plates of hot food to the 2 women and cookies/candy for Eva. In our hos­pi­tals the patient usu­ally receives food, but there are time the hos­pi­tal doesn’t have (so we have donated dur­ing these lean times). But there is no “hos­pi­tal cafe”, so each fam­ily is respon­si­ble for pro­vid­ing food to those car­ing for the sick. We pro­vide money so they can buy what they want at the mar­ket next door to the hos­pi­tal for break­fast and lunch. Their all-time favourite, Nsema (stiff corn meal mush) and sar­dines is what we take them for sup­per. This is a real treat to them and it puts a smile on their faces. On Thurs­day, the triplets all had upper res­pi­ra­tory infec­tions given to them by their 7 year old brother who coughed on them. I pile the whole fam­ily into my King­Cab and off we go to see the Doc­tor. They are treated and I take them home (but the Doc did lab smears for malaria as triplet #2 has a high fever). I arrive at 2pm to take Eva home as she has been released. She was so eager to get out of there that as soon as she saw me, she made a bee-line for the car! The Doc sees me and tells me to go fetch Triplet #2 (Janeeta) for she has malaria and needs imme­di­ate hos­pi­tal­iza­tion (since she has a res­pi­ra­tory infec­tion also). So off we go, drop­ping off Eva at her home, and then pick­ing up Triplet #2. Thank the Lord that the grand­mother was vis­it­ing, so she could pro­vide sup­port for the mother at the hos­pi­tal. Janeeta should com­plete her med­ica­tions by Sun­day and hope­fully be released by Mon­day. In the mean­time, Bunny keeps hop­ping along with hot Nsema and fish for the caretakers. Salazar lives in the vil­lage of Nacala, 3 miles (5 km) from our near­est church in Rovuma. To get to Rovuma church he has to wade a river that can be waist deep at times. Salazar stud­ies the Bible intensely, and loves to lead the singing at church. At last week’s ser­vice, I notice his shoes were in tat­ters, lit­er­ally falling apart. 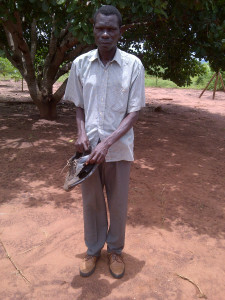 When I noticed the shoes, I also received a “silent mes­sage” from the Holy Spirit, say­ing get him new shoes. I see peo­ple with no shoes and old shoes all the time, so this is not my own head doing this, but the Lord. After church I tell him what the Lord says and he gets VERY excited. Since our mar­ket never closes, he was able to get him shoes that same day. JESUS SAW HIS HEART AS WELL AS HIS SACREFICE AND BLESSED HIM. He’s the ONLY Chris­t­ian in that village. BALAMA BRIDGE FIXED IN 1 DAY—a true miracle! On Mon­day, I posted pho­tos of the road/bridge that washed away. 30 DUMP TRUCK LOADS OF HUGE ROCKS later (9 hours of fast work), and the road was again pass­able. The aver­age road fix around here is 5 days, so all of us were totally amazed. Seems the road crew has a new leader who is a real “doer”. Eric has talked with him and says this man knows how to get a job done quick! A nice change. INSPECTORS DUE AGAIN THIS WEEK, so prayers for favor are appre­ci­ated. Not sure what date yet, but they say they are com­ing now that the bridge is fixed.